A day or so after the first nest of yellow jackets had been excavated and the denizens presumably eaten, we spotted another crater with an unfortunately thriving nest. That it was a crater rather than a mere hole confused us until we saw some fragments of what passes for comb nearby with brood visible and yellow jackets around it. Someone had apparently dug up the nest and either was not sufficiently hungry or was driven off by a larger horde than could be tolerated. After dusk when it was quite cool and the wasps presumably settled down for the night we carefully placed the end of a garden hose into the crater and let it flood all night. Next morning there were but a few yellow jackets flying around the puddle. Sadly, after we removed the hose and let the water drain the horde was once again flying, apparently undiminished. Last night we merely hoped that our ally would return to the crater for a snack but while the stray comb on the ground was gone early this morning there still seemed a few wasps sleepily emerging and then returning, not quite ready to start their day. 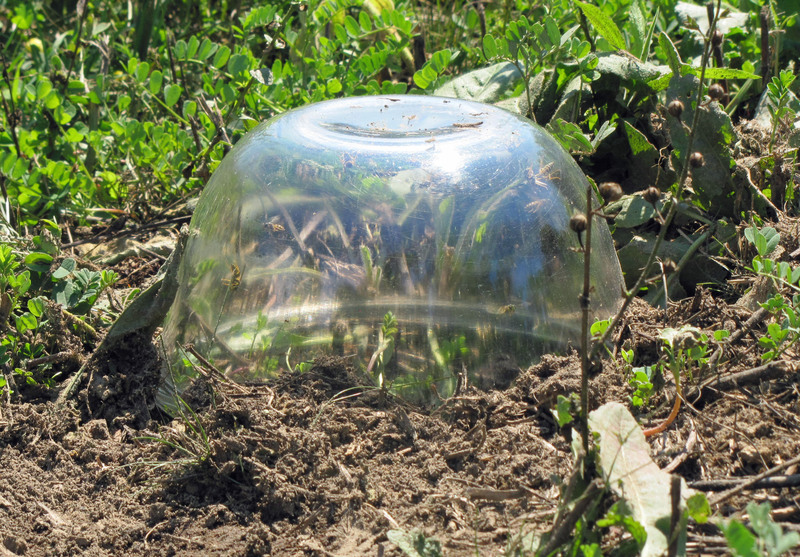 Before it got any warmer and the pests more active we quickly placed a glass bowl over the hole, kicking dirt around the rim to seal it against the uneven ground. If it works this will take a few days, perhaps a week. Supposedly the wasps see light and so, rather than dig out, simply fly at it, repeatedly dashing themselves against the bowl. Even while they live, as long as they do not get out, we will feel better. If this fails it will be time to try Matthias Wandel’s solution and cobble a wasp sucker from our shop vac. Luckily we have the necessary length of heavy gauge extension cord from our seasons of using an electric-drill-powered bulb auger to line the long driveway with daffodils. Updated 2018-Sep-10 : What a very late update. It took almost a week but the glass bowl method worked well and gave us the sadistic satisfaction of watching the wasps beat against the glass ever more weakly and in smaller numbers as the days wore on. We used it again the following year on a new nest and since then none have nested near enough to the hives or our home to be a problem. If you have sunny days, you may get a solar cooker going to help in the genocide. We can only hope. The linked article suspects that they are too deep to be so affected but then no one is certain how this method works when it does. We have successfully eliminated several yellow jacket nests with water and clear plastic. Like your technique, we soaked the hole overnight, but used a sprinkler to get the overall area good and wet, and in the morning dumped some ice over the hole itself for added effect. While the morning was still cool, we carefully covered the area with a fairly sturdy UV-stabilized clear plastic, weighting it down around the edges with bricks and pavers. We left the plastic in place about a week during the hot, sunny season, and the yellow jackets were eliminated. It probably took less than two days, but we wanted to be sure, since it was a garden area that the family frequented.